Our resounding win in The Woodlands Township election last week continues to leave a bad taste in the mouths of the political establishment. 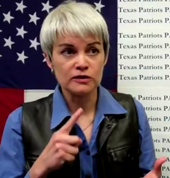 Voters overwhelmingly accept our Texas Patriots PAC voter guide as we politely offer to them. Establishment candidates are becoming desperate. If imitation is the sincerest form of flattery, then we accept the compliment! As reported here by TexasGOPVote, "volunteers" spent much of Wednesday passing out a copycat voter guide from "The Original Tea Party of Montgomery County", which lists their endorsements on one side and touts the merits of three establishment Republican candidates on the other. Two are incumbents, and one has a longtime Board member as their campaign manager. The voter guides were brought to the polls by a recently defeated Township Board candidate. The ballots were distributed from the campaign tent of the establishment candidate for county commissioner and lists those in office or who have been coroneted by the establishment to take over the open positions. We are taking fire from the establishment right now because we are over the target. Last week, everyone saw that the Texas Patriots PAC can deliver the votes on behalf of our supported candidates. The political clique in The Woodlands recognizes the profound threat to their power that a Tea Party supported candidate with a reasonable campaign can be. Our volunteers are simply expressing which candidates best meet our criteria for support, and we have mounted an effective campaign to get that word out to voters. The political establishment's actions are a sad, frantic attempt by the establishment to steal the votes of people who want to support the work that the Tea Party has been doing for the last three years. It is a shame to see elected officials and their supporters acting in such a disgraceful manner. Will you help our supported candidates succeed by spending an hour or two working at the polls? Call 713 400-1272 and we'll work you into the schedule for early voting or Election Day. Thank you for getting active in this most critical primary election!